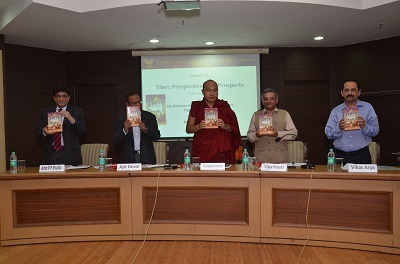 Tibet: Perspectives and Prospects, a publication of Vivekananda International Foundation, was launched on 6th November 2013, by His Holiness the 17th Gyalwang Karmapa, Ogyen Trinley Dorje. Shri Ajit Doval KC, Director VIF, Ambassador P P Shukla, Joint Director VIF and Editor of the book, Shri Vijay Kranti, noted Tibet expert, and Vikas Arya, the publisher of the book. In his opening remarks, Shri Doval highlighted the strong bonds of fraternity India has always shared with Tibet. He pointed out that that despite events of modern history, for India, Tibet has always remained an individual and single entity. Maintaining that nothing stays constant, he expressed hope that the sad state of affairs that engulfs Tibet today will certainly improve and the people of Tibet will see a bright and peaceful future. Ambassador Shukla, the editor of the book, highlighted two major aspects which the book deals with. Firstly, it reflects the sense among the authors of having let down the Tibetans in their hour of greatest difficulty. It is a mea culpa on the part of the contributors to the book. Second, he referred to the dimension of India’s security concerns. For India, Tibet is not just a civilisational peer, but also a safeguard against unfriendly foreign forces. It was bewildering, he said, to note that India in the late 1940s and early 1950s, keeping the thousand year old friendship with Tibet at stake, allowed the Chinese invasion in Tibet to consolidate itself without challenge – to the point where we actually blocked UN discussion of the issue. Disturbingly, India also became the first nation to recognize Chinese sovereignty over Tibet. However, it was not too late even now to take up the Tibetan cause and to join in the struggle of Tibetans. The issues which the international community could take up today are those of the deteriorating human right situation, water-related issues in Tibet which affect many of the lower riparians in Asia, and the right to self-determination for the people of Tibet, enshrined in a UN General Assembly Resolution of 1961. His Holiness expressed his gratitude towards the Vivekananda International Foundation for publishing a book that holistically takes up the cause of Tibet and its people. He strongly emphasized on the relationship that people of India and Tibet share. This relation, His Holiness maintained, is deeper than mere political or economic. The relation is spiritual and cultural and it goes so deep that it becomes the basis of Tibetan identity. He argued that despite all the mistakes that Tibet and India did half a century ago, Tibetans realize the fact that India is the mother from where the Tibetan culture originated and like a mother, India has helped and nurtured the people of Tibet in recent times of struggle and difficulties. The session then opened up for the participation from the audience who expressed their views and shared their views, which included the call for a national debate on the cause of Tibet and also the need to introduce India’s Tibet policy as separate from its China policy.